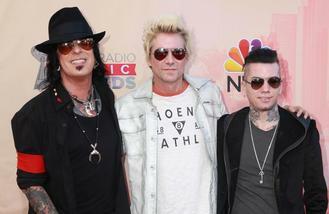 News - Nikki Sixx: Tour has been like boot camp for Sixx:A.M.
Nikki Sixx: Tour has been like boot camp for Sixx:A.M. The heavy metal trio - comprised of lead vocalist James Michael, Motley Crue's Nikki Sixx and former Guns N' Roses guitarist DJ Ashba - have been busy performing their first headline shows in the US whilst also touring the festival circuit in Europe and Nikki admits they've been learning on the job how to be a good live act. Speaking exclusively to BANG Showbiz at the Isle of Wight Festival on Sunday (12.06.16), the 57-year-old rocker said: "It has been a bit like boot camp because we didn't know how to be a live band. We knew how to be a studio band, to be songwriters and create art, but to take that to the stage has been a lot of fun for us. "There have been a lot of shows where we have not known how we were going to go down, but we just did what we do and it has been a little bonus at the end of it." And while fans of Motley Crue and Guns N' Roses might have heard of the band name Sixx:A.M. frontman James feels very few people actually know what they are "all about". The 47-year-old frontman said: "Even though we've been together for 10 years we've not had the opportunity to do very much touring. So this is a big year for us. We've spent the month in the states doing a lot of festivals and headline shows, we've been over here in Europe doing a lot of festivals. We are playing for a lot of people who may have heard the name Sixx: A.M. or heard a few of the songs, but don't really know what we are all about."